It's been their mantra all season. You can't see it, but it's been hanging in their dugout right next to the Boston Strong 617 jersey. No hit the night before into the ninth inning? Find a way. No hit again into the sixth inning by probable American League Cy Young Award winner Max Scherzer? Trailing 5-1 in the bottom of the eighth inning, David Ortiz (pictured) found that way, depositing the first pitch he saw from Joaquin Benoit into the Red Sox bullpen for a game-tying grand slam. On a day when Tom Brady had found a way for the Patriots to beat the New Orleans Saints with five seconds left in the game, the Red Sox had just found a way to knot things up at 5. Was there any doubt at that point that the Sox were going to win? Jarrod Saltalamacchia erased any of that with a single against a drawn-in Detroit infield scoring Jonny Gomes with the winning run. 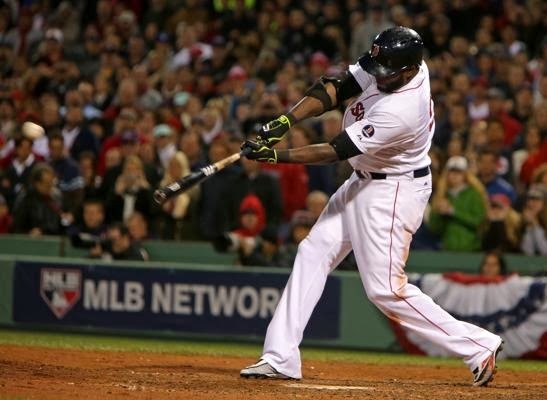 Boston's 6-5 win over Detroit evened the American League Championship Series at a game apiece. Game Three is Tuesday afternoon in Detroit. Clay Buchholz held the Tigers to just one run through five innings before Detroit scored four in the top of the sixth to take a 5-0 lead. Buchholz allowed two home runs sandwiched around a pair of doubles for the runs. The Red Sox got one back in the bottom of the inning on an RBI double by Dustin Pedroia that scored Shane Victorino.